The contemporary Arte range, in 75 and 33cl, is the most recent addition to the Sole Collection. In a sleek, multi faceted clear glass bottle, and available in either still with a silver cap or sparkling with a gold cap options, Arte provides the same crisp taste of Sole in a new exquisitely designed shape. Art is born of love of beautiful things, and must be unique and innovative. 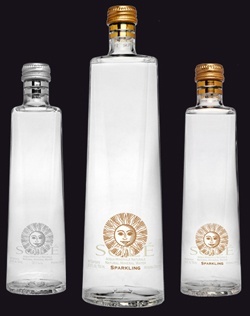 The values of Art are reflected in the beauty of the Arte bottle . A glass bottle, clear and bright, starting round at its base and with facets tapering upwards, irregularly octagonal. A bottle to adorn the most chic restaurant tables of Italy and beyond, capable of transmitting at first glance the idea of a natural mineral water produced with love and served in accordance with the ideals of Art herself.